The energy at Tres' Jazz was electric! Nearly 2,500 Jazzercisers from around the globe have invaded New Orleans — the birthplace of Jazz — for fun-filled days of shopping, partying and of course, dancing! My mom & I arrived on Wednesday. Here she is striking a pose on the famous Riverwalk. We headed out to the French Quarter for dinner on our first night. On Thursday the rest of our crew arrived. Tressa & I peruse the schedule and try to map out our classes. The Shopping Expo opened and the craziness began. Togs had loads of great bargains, you can see the madness below. We escaped to the sidelines to review and try on our Togs bargains. Tressa & I look happy with our loot, or maybe just happy to have survived the Togs chaos. Thursday afternoon we attended two Instructor Only events. mailboxes. The Taping Team was on hand for Q &A in an "Oprah" sort of setting. Thursday night was the Instructor Reception and it was first class! This group certainly cleans up well. Joining Tressa & I are Sarah (from Pennsylvania) & Becky - soon to be instructor in Stamford...ssh....don't tell anyone Becky was smuggled in! We had catfish and jumbalya and good and met some new friends. We caught up with some old friends too… including Shannon, who is running very successful classes in Chicago . Among the favorite classes was of course Tim Roberts , especially his Ballroom Bounce. Check him out for yourself! It was an honor to be a part of the East Coast Circuit class and to teach with such a dynamic group of professionals. As always the Men's class was a highlight, as well as Dancin' Abs, Party Jazzercise with Kenny (my favorite Jazzer-guy), Guts & Butts with Shanna & Rich, and so much more!!! We caught up with Kara as well. She is as hilarious as ever, even now that she's a married woman :). Mom & Kara, & Tressa & I wait for the Opening Night Show to begin. The incredible Charmaine Neveille also performed www.charmainenevilleband.com as well as the amazing Giordano Dancers, named after Gus Giordano, Judi Shepard Missett's mentor. The show was very informative and we learned a lot about the history of jazz and the culture of New Orleans. Charmaine Neville said that we could have gone to any other city in the country, yet we chose to come there and for that each of them was truly grateful. Many people we met echoed her message. The food definitely lived up to his reputation. Mom & Kara brave Bourbon St.
Becky scored us a bunch of beads! Of course we had to make a stop at the House of Blues.....it's Naw Orleans after alll! (Just search for me), including more of our party on Bourbon St. Although remember, what happens in New Orleans, stays in New Orleans, right?? 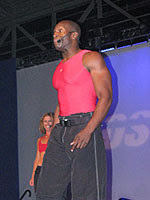 I loved checking out the jazzercise.com photos for a glimpse of some of the stuff I missed. As with all Jazzer-events, we returned home happy, exhausted, sore and with plenty of shopping bags in tow. A good time was definitely had by all! !